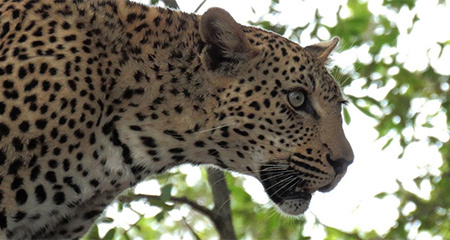 South Africa has the widest choice of top class safari lodges of any country in Africa. Situated in the south-western part of Kenya in the Great Rift Valley, the Masai Mara is one of Africa's most iconic safari destinations and offers outstanding game viewing all year around. A safari really is the experience of a lifetime and Africa holds a world of possibility for anyone hoping to search out the Big Five in the wild. There is a handful of world-class wildlife destinations scattered across Southern and East Africa, so there really is the perfect safari out there for every kind of traveller, whether you’ve got a young family in tow or you’re simply young at heart. Here’s a handy overview of Southern and East African safaris that we’ve put together using a whole decade of our expert knowledge. Hopefully, it will help you get one crucial step closer to your very own African adventure. With a wealth of top-notch safari destinations offering jaw-dropping game drives through the bush, South Africa is a serious winner when it comes to wildlife and spotting the Big Five. The Kruger National Park is South Africa’s crowning glory when it comes to close up animal encounters, but the Rainbow Nation also has an amazing assortment of alternative safari opportunities up its sleeve. You can explore the Garden Route and end your trip with a safari in the Eastern Cape, race across remote wilderness of the Madikwe Game Reserve or soak up the stunning scenery on safari in the Waterberg. Another fabulous option is to spend some time exploring the hidden wildlife gems tucked away in KwaZulu-Natal as part of a longer tour around this stunning and diverse province. Whether you’re after a traditional Big Five safari in the heart of a classic headliner reserve or you’re looking to stray off-the-beaten safari track, South Africa will have something that fits the bill. 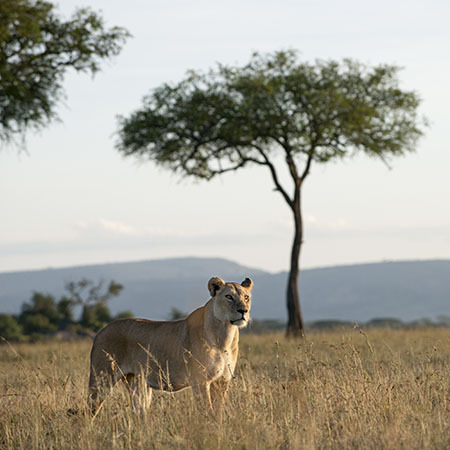 Tanzania is extraordinary safari terrain, with the endless plains of the Serengeti, the snowy peak of Mount Kilimanjaro and the incredible wildlife-crammed caldera of the Ngorongoro Crater. It’s a spectacular place for a scenic safari, with game drives taking you across the vast savanna as the African sun sinks into the distant horizon. This is the African that many travellers have always imagined, and Tanzania offers classic safaris in some of the planet’s most deeply revered wildlife hotspots. 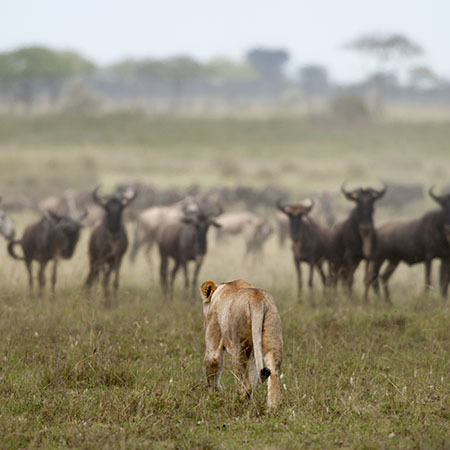 However, there are plenty of more remote reserves to explore in Tanzania as well as the main headlining safari destinations, making Tanzania an excellent choice for both safari first-timers and true wildlife addicts that return to Africa year after year. 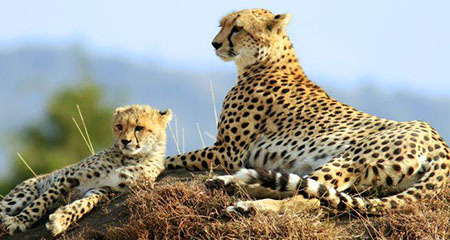 South Africa is the only country in Africa to feature malaria-free safari reserves, making it an unbeatable choice for families and anyone concerned about taking anti-malaria precautions. In the Eastern Cape, conveniently located at the far end of the Garden Route, as well as the remote wilderness of Madikwe Game Reserve, you can enjoy a malaria-free safari with total peace of mind. True, you may still get nibbled by a friendly mosquito, but these ones don't carry the malaria strain so they are still annoying but 'safe'! 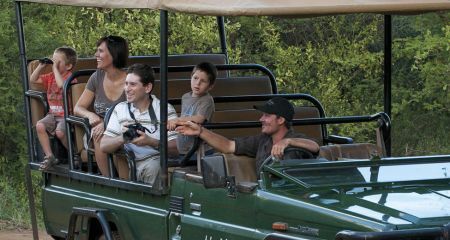 Watching the wide-eyed astonishment of your kids as they encounter their first elephant or lion in the wild is something quite magical, and there are several safari spots that are specifically excellent for familiy safaris. Some lodges even offer dedicated children’s programmes to keep your little ones entertained while you grab some well-earned time by the pool. If your kids are too young to join you on the game drives, these lodges will also arrange alternative activities or childcare. We aim to bring our customers amazing safari experiences at affordable prices, so we constantly keep our ears to the ground for special offers and promotions. Often, you can grab an extra night FREE when you pay for 2 or 3 nights, or get a free stay at a 5* hotel when you book a safari. We’ve always got some great deals on the go, so take a look at our Special Offers page for more details and be sure to check back often. Going on safari really doesn’t need to break the bank and there are brilliant options out there to suit more modest budgets. Having been in the Big 5 business for a long time now, we know some great tips and tricks and making your safari budget stretch that little bit further! 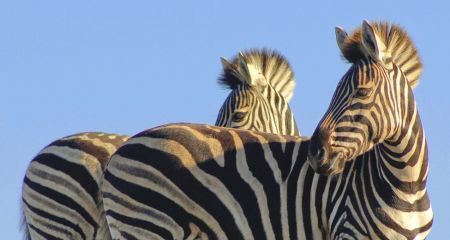 Take a look at our guide to safaris on a budget for some handy ideas about getting the most for your hard-earned money. The Great Migration is a safari experience that will leave you completely speechless and one of the world’s most incredible naturally occurring events. Known as ‘The Greatest Show on Earth’, it’s a humbling display of African wildlife so spectacular that it’s difficult to put into words. Each and every year, over 1.5 million wildebeest, 200,000 zebras and 350,000 gazelles gather on the golden plains of the Serengeti in Tanzania before beginning their epic journey to Kenya’s Masai Mara and back again, following the rains. This amazing race for survival covers over 1,800 miles, the earth rumbling with the thunder of almost 10 million hooves that kick up huge swirls of dust on the savanna. Seeing the migration first-hand is something quite staggering to behold. It’s so much more than a safari and, using our experience and contacts, we know just how to put you at the centre of the action. A remote land rich with weaving wetlands, lagoons and delta plains, Botswana will exceed even your wildest safari expectations. Rated as one of the top safari destinations in the world, Botswana is home to the Big Five and so much more, giving you an exclusive glimpse into wild Africa. Game drives in Botswana take place on the water as well as solid ground, with river safaris taking you deep into the Okavango Delta where hippos line the riverbanks and crocodiles lurk in the shallows.You can even explore the wetlands by mokoro - a traditional dug out canoe, giving you a totally different slant on your safari. 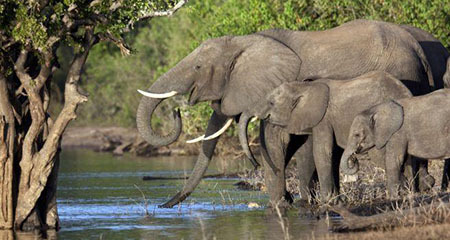 Chobe National Park, near the colossal Victoria Falls, is the stomping ground for the largest elephant population in the world. Kenya is Africa at its most iconic, from the endless golden plains of the Masai Mara to Amboseli National Park with its snowy backdrop of Mount Kilimanjaro and the scenic serenity of the Laikipia Plateau. Vast herds roam the sun-streaked savanna. Big cats stalk through the long grass and the waterholes are a hub of animal activity at dusk and dawn.Glide over the plains as the sun rises in a hot air balloon, followed by a champagne breakfast celebration. This is Africa as you’ve always imagined it. In addition to the superb wildlife, you can also visit timeless ethnic tribal cultures which have somehow managed to remain unchanged by today's modern world. 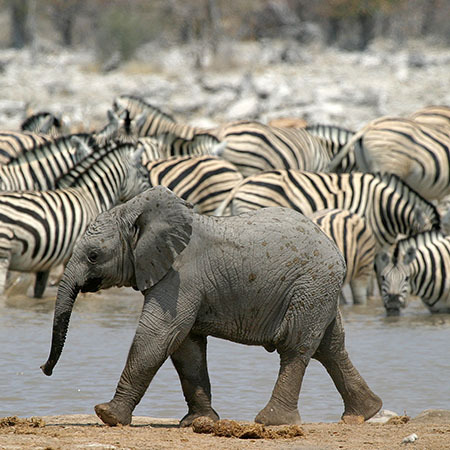 Tucked away in northern Namibia, Etosha National Park offers some of the most spectacular, and certainly the most surreal, wildlife viewing in Africa. Etosha, which means ‘huge white area’ in Owambo, centres around a vast white salt pan dotted with bush savanna and scattered with bizarre ‘upside down’ moringa trees. It’s an otherworldly landscape that has to been to be believed, much like the rest of Namibia. The Park is home to 114 different mammal species, including 4 of the Big 5 - leopard, lion, elephant and rhino (both black and white), as well as nearly 400 species of bird. Etosha is also home to 3 rare and beautiful antelope species - the black-faced impala, the roan antelope, and Southern Africa's smallest antelope, the Damara dik-dik, which stands only 40cm to the shoulder as a fully grown male adult. 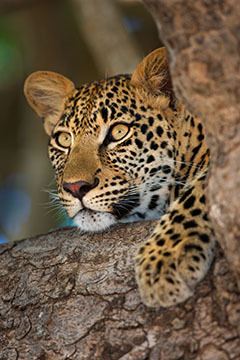 Landlocked within the heart of Southern Africa, Zambia has several safari surprises in store. Famous for the crashing majesty of Victoria Falls which creates a natural border with Zimbabwe, Zambia was overlooked as a safari destination in its own right until quite recently. If you choose to explore further afield than the Falls, you’ll discover some real untouched safari treats, but you’ll need to be quick because the secret about Zambia is definitely getting out. What is a Private Safari Lodge? 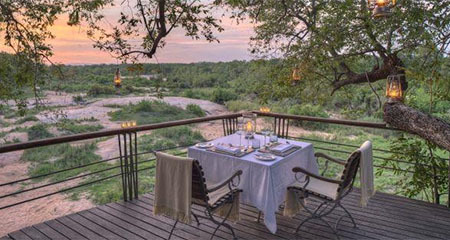 Private lodges offer exclusive safari experiences, atmospheric accommodation and outstanding service levels. 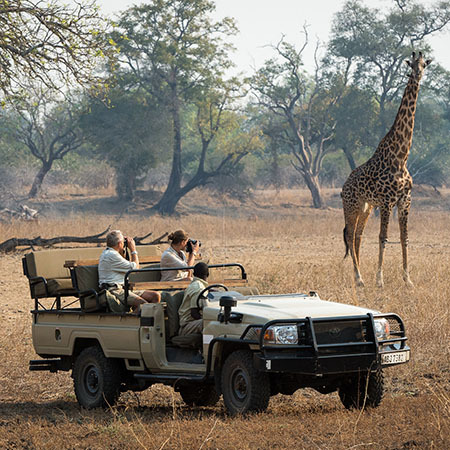 Privately owned, the experienced game rangers and trackers can venture off-road during game drives, allowing you to follow the Big Five deep into the wilderness of the bush. Southern and East Africa are home to a wonderful assortment of private lodge accommodation, from vintage tented camps to classic colonial lodges, quirky tree houses and thatched chalets overlooking waterholes. These lodges cover a whole spectrum of budgets, ranging from comfortable and cosy to lavishly indulgent, and our guide will tell you what to expect from a private safari lodge. Over the years, we’ve sent our customers into the heart of Kenya’s Great Rift Valley, the savanna of the Serengeti and the stunning south coast of South Africa, and we’ve working with a number of companies along the way. Now, after planning safari holidays for a decade, we can now recommend certain companies without hesitation, trusting them completely to deliver a first-class safari experience for our guests. If you stay at a lodge run by one of these brilliant companies, we are sure that you’ll have one of the best safari holidays that Africa has to offer - and you can quote us on that! On the whole, safaris are exceptionally safe. This is especially true of private lodge safaris, where visitor safety is the number one top priority. Game drives are always led by qualified, experienced rangers and trackers and the lodge staff will go out of their way to keep you both safe and comfortable. 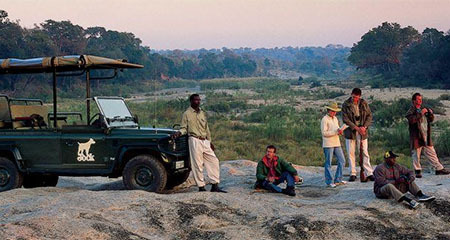 Self-drive safaris are also exceedingly safe provided that you follow the basic common sense rules, which exist purely for your own security. You’ll always be notified about the rules before entering a National Park for a self-drive safari, so if you stick to the advice you’ll be just fine. 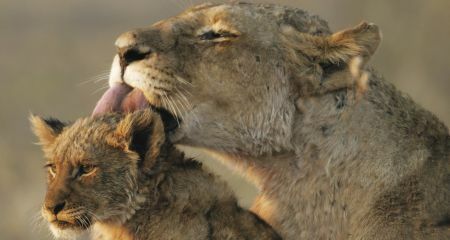 Recapture the romance of a bygone era, and spend your safari under canvas surrounded by the sounds of the African bush.